It is known for its versatility, softness and comfort. It can be weakened by sunlight and perspiration. Care instructions: Depending on how silk has been treated it may need to be dry cleaned, hand washed, or may be machine washable. It may turn yellow and fade with the use of a high iron setting. A press cloth (a cloth used between an iron and a garment) and a steam iron are recommended. F-studio has revolutionized the concept of affordable and stylized clothing for women. It draws inspiration from different cultures and believes in blending them. 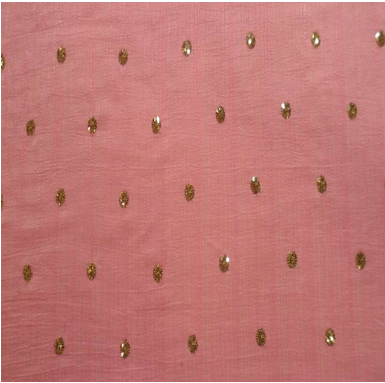 Fabrics here range from Silk, Georgette, Chiffon, Velvet, Satin, Brocade, Linen, Zari, Cotton, Crepe, Digital prints and much more. These fabrics are highlighted with sequins, machine embroideries, hand embroideries, block printing, hand printing and various value additions to create individual masterpiece. F-studio was the first to make ready to dye sequenced and embroidered fabrics. F-studio showcases its designer collection in numerous ways by participating in the national and international textile fairs and exhibitions as well as being a part of successful fashion events. It boasts of over 3000 varieties of fabrics in original prints and designs with our own printing and designing units, the store has the ability to customize with the value addition according to the needs of the designer, which invariably makes us a designer's paradise. F-Studio stands as the first retail chain dealing in designer fabrics. The USP of the store is the exclusively designed, Eco-friendly, natural dye able fabrics. The fabrics are very reasonably priced due to no in-between cost involvement. F-studio is the authorized dealer of Asahi Bemberg - Japan, and partners for Modal Yarn of Birla Group, enabling us to make skin friendly natural fabrics. We have a team of designers and craftsmen who work to innovate and design keeping abreast to the fashion trends. They work towards achieving customer satisfaction by introducing new designs and concepts on a regular basis. Owing to the efforts of our team we are able to meet the demands and requirements of the fashion world.